Pursuing the family name as the finest silk producer in Lyon, the young Huguenot Rachelle Dushane-Macquinet is thrilled to accompany her famous couturier Grandmere to Paris, there to create a silk trousseau for the Royal Princess Marguerite Valois. The Court is magnificent; its regent, Catherine de Medici, deceptively charming … and the circumstances, darker than Rachelle could possibly imagine. At a time in history when the tortures of the Bastille and the fiery stake are an almost casual consequence in France, a scourge of recrimination is moving fast and furious against the Huguenots-and as the Queen Mother's political intrigues weave a web of deception around her, Rachelle finds herself in imminent danger. Hope rests in warning the handsome Marquis Fabien de Vendome of the wicked plot against his kin. But to do so, Rachelle must follow a perilous course. 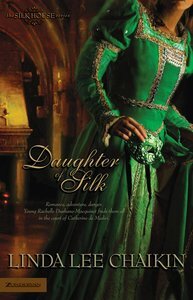 About "Daughter of Silk (Silk House Series)"